Jammu Kashmir, Punjab, Himachal Pradesh, Haryana, Uttar Pradesh and the newly formed Uttarnachal state are the six states, which make the North part of India. The traditions and cultures of celebrating a particular festival differs not only from state to state but also from the hilly region to the plains. Festivity brings alive the spirit of the people staying in the northern part of India. The all time fertile land of five rivers is Punjab. The land of the dare devil Sikh community. The religion was born to save the motherland and the Sikhs and the Punjabis, ready to take any risk, accepted it. India has been represented by the Sikh community venturing out for business to far fledged lands, more than anyone else from India. 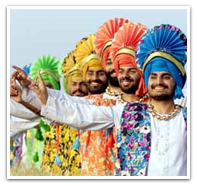 Baisakhi is the New Year day, falling in Mid April, of the Punjabis. They sing, dance and make merry on this particular day. It is also a harvest festival, when the golden wheat ripens and fills the heart with Joy. It was on this day nearly 450 years back that the Sikh Guru started the custom close to baptism to Sikhism. People visit temples and Gurudwaras to worship. They gather and the men folk dance the famous Bhangra on the tune of huge drums and the women start the Giddha to accompany them. Preparing and eating goodies and singing is also part of the celebrations. An annual festival held at Anandpur Sahib in Punjab, Hola Mohalla was started by the tenth Sikh Guru, Gobind Singh, as a gathering of Sikhs for military exercises and mock battles on the day following the festival of Holi. The word hola is adapted from halla, meaning attack, while mohalla means the place of attack. On this three-day festival mock battles are held followed by music and poetry competitions. The martial tradition with mock battles and displays of swordsmanship and horse riding is the highlight if this festival held in March. Gurupurab is another important festival for the Sikhs and the Punjabis. Birthdays of reverend Sikh Gurus, Guru Nanak and Guru Gobind Singh and the martyrdom of Guru Teg Bahadur and Arjun Dev is remembered on these days. The first full moon night falling after Diwali is the birthday of the first Sikh Guru, Guru Nanak. The festival is celebrated with great exuberance. They burn crackers and decorate their houses with lights. The state is full of surprises and is known as the paradise of India. Jammu and Kashmir are actually the crown of India, the northern most state. The mystic Leh, the beautiful valleys of Kashmir and the huge Shrines of Jammu, comprise a treat for the traveler. Followers of Islam, Buddhism and the Hindus, all stay in peace in this state blessed with natural abundance. The great Himalayan mountain range forms a superb background to this unique state. All the Hindu, Muslim, Sikh and Buddhist festivals are celebrated here with all the enthusiasm and vibrancy. Vaitha-Vatur-Truvah which literally means thirteenth day of source of River Jhelum. It is held at an ancient temple at Verinag, the source of the Jhelum. Hindus and Muslims participate in this festival. 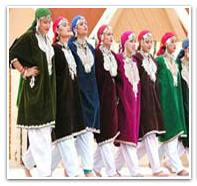 The Urs (or Ziarats) is a typical Kashmiri festival. It is held annually at the shrines of Muslim saints on their death anniversaries. Urs of Meesha Sahib, Urs of Batamol Sahib and Urs of Bahauddin are particularly famous. These Urs are popular despite the rigorous weather. Celebrated in different parts of Srinagar, not only Muslims but Hindus and Sikhs also take the blessings. Sindhu darshan festival is another important festival when the Kashmiris come from all over the state to worship the source of the River in Leh. There are many Buddhist Monasteries in the part of Leh as the major population of Leh and Ladakh practices Buddhism. Few typical Leh Buddhist festivals such as the Yuru Kabgyat celebrated in July. Dances with masks are performed and the masks worn by the lamas during the dances represent guardian divinities. Doscmoche is another ancient festival, still celebrated every year in February with great pomp and fervour. The courtyard of the chapel below the gates of the Leh of the Leh Palace comes alive with the music of drums and the thumping steps of the masked Lamas from different monasteries performing the sacred dance-drama. The Lamas prepare, consecrate and eventually destroy the sacrificial offerings as the climax. Himachal Pradesh, known as the abode of Gods is another picturesque region of Northern India. The people of this region based on the foothills of Himalayas are religious and celebrate their festivals with gaiety and pomp. The Phulaich festival celebrated in the Kinnaur district in month of September is unique in tradition. This four day festival is celebrated as the flower festival by the people of Himachal. The Rajputs of the village go to pluck flowers from a specified mountain and return only the next day. The night is spent singing and dancing. On the third day, the village deity is taken out and bedecked with all the finery along with the numerous flowers. A procession is taken out and the rests only the next day when an animal is sacrificed. Although this is a beautiful festival, the more famous and promoted is the Dushera of Kullu. Dushera is celebrated all around India, but not like that in Kullu. The celebrations start in Kullu when the celebrations of India for Dushera finish. The presiding deity of Kullu, Raghunathji is taken out on this day and around 600 deities of Himachal come to pay respect to this deity. Huge colourful processions mark the occasion and by the end of the festival the Lord is bathed in the Beas River and then taken back to its main temple. Singing and Dancing and worshipping is the core of this festival celebrated with pomp and show. The state of Haryana is full of greenery and the places in Haryana are ancient having a mention in the Mahabharata. Due to the proximity to Delhi, some places in Haryana like Gurgaon and Faridabad have recently gained extreme importance as the satellite towns of Delhi and have been added to the list of the National Capital Region. All the common festivals like Holi, Diwali and Dushera are celebrated in the state. But the Haryanavis celebrate two important festivals with great fervour. Teej festival is celebrated during the month of July – August, to welcome the month of Sawan, bringing rains. Mainly ladies and girls enjoy this festival more than the men folk. The dupattas in bright red or pink with beautiful motifs of golden thread are worn, swings are hung on trees to play with and henna is applied on palms. A colourful festival, where the girls and the married ladies worship Lord Shiva and Parvati. Sanjhi is another important festival celebrated and worshipped as the mother goddess by unmarried girls of Haryana. They make the image of Sanjhi with mud using various shapes. These shapes include stars, moon, sun, face of the goddess and are then coloured. The festival takes place in early October or late September and the art associated with the festival is unique and very naïve. Gangore is celebrated around March -April. Idols of Ishar and Gangore are taken out in procession and songs in their praise are sung till they are immersed into water. This spring festival is held in honor of Gauri, the goddess of abundance. Uttar Pradesh – the most populous states of India is also one of the most ancient cradles of Indian culture. Two great Rivers along with one mythological river that of Saraswati flow through this state. Abundant with natural wealth and resources, Uttar Pradesh ahs given India most of its Prime Ministers. The common Hindu festivals of Diwali, Dushera and Muslim festivals like the Ids are celebrated with vigour over here. The state wears a vibrant colour throughout the festivities. Some unique festivals to Uttar Pradesh includes the most famous, Lathmar Holi. 48 km. from Mathura at Barsana, is celebrated the famous Lathmar Holi of Braj. Tradition has it that Krishna from Nandgaon use to come to Barsana to play Holi with Radha along with his Gopi friends. The Gopis after merriment chased them away by beating them with lathis or big bamboo sticks. Hence the name. To this day, the village women beat up the men from Nandgaon and chase them away. The month long Kumbh Mela of Allahabad is one of the largest fairs of the world and is attended by millions of pilgrims from all over India as well as the devout from the world over. This religious occasion takes place in the months of January-February, on the banks of the holy confluence of rivers Ganga, Yamuna and the mythical Saraswati. It is believed that a holy dip on this occasion washes all the sins. There is annual Kumbh, six yearly and the most important is the one that comes every twelve years. The beautiful Kartik Purnima festival or the Dev Deepawali celebrated in Varanasi or Benaras, is a visual delight. Varanasi is the land of festivals. The full moon night after Diwali falling in November – December is the sacred day for all the people. The ghats of Varanasi come alive with thousands of brightly lit earthen lamps. The lamps then are gently left on the River. Visitors throng in large numbers to watch this spectacular event. Other important festivals celebrated in the Uttar Pradesh are the Ramnavami at the birth place of Ram, in Ayodhya and Janmashtami, at the place of Krishna in Mathura. These festivals are celebrated with great pomp and show in these two places as compared to other places in India. The land of celestial beauty that is what the new state of Uttaranchal is all about. Blessed with magnificent glaciers, majestic snow-clad mountains, gigantic and ecstatic peaks, valley of flowers, skiing slopes and dense forests, Uttaranchal is traveler delight and also a pilgrimage site for the Hindus, nestling the four most sacred places of Badrinath, Kedarnath, Gangotri and Yamunotri in its mighty mountains and deep valleys. The Mata Murti Ka Mela held in the Champavat region in September is the unique festival. On this day the mother of Badrinath is worshipped, and a large fair held at the Badrinath Temple. Among the four sacred places of India where the Kumbh is held, one of them is Haridwar in Uttaranchal. The Magh Mela during Sankranti in the Kumaon region is another important festival.